Sick of glass and steel skyscrapers cluttering up the city’s skyline? Don’t worry – the next one could be made of wood. In news set to excite beavers and terrify firefighters, plans have been released for a new 300-metre tall building made mainly from timber. The project, presented to the Mayor by Cambridge University and architects PLP and Smith and Wallwork, is pitched as a new addition to the Barbican complex. The tower, which if green-lit would comprise over 1,000 residential units (or ‘homes’ as we used to call them), would stand more than twice as high as the Barbican’s existing residential towers, neatly offsetting the estate’s famous concrete aesthetic. But with Londoners starting to get more than a bit cynical about mega high-rise buildings, is wood really the answer? The architects certainly seem to think so. ‘We believe people have a greater affinity for taller buildings in natural materials rather than steel and concrete towers,’ they said, adding that wooden buildings also benefit from being renewable, cheaper and easier to build. 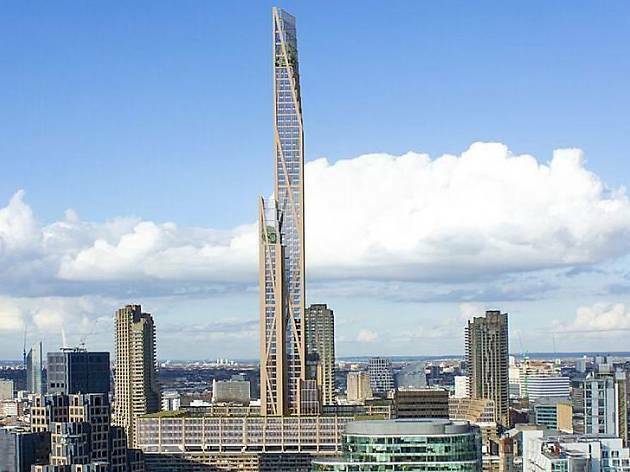 So we’ve had the Shard, but is London really ready for the Splinter? In other architecture news, plans for the tallest skyscraper in the City have just been approved.